The primeval beard is back. At least it’s back here, in North America. Elsewhere, not only hasn’t it left, it’s also, in some places “man”-datory, e.g., more patriarchal or religiously conservative cultures. But here, it is back in such a big way that Proctor and Gamble has blamed the beard for slumping sales of shaving products. Even Superman Henry Carville sprouted and sported one in the first reel of 2013 Man of Steel, as did Russell Crowe, who played his Kryptonian father; so did the Krypton arch villain and approximately half of all the male actors and extras in modern Metropolis. Then there are the 2014 Oscar-nominees: Both male leads in Oscar-nominated American Hustle—Christian Bale and Bradley Cooper; Tom Hanks in Captain Phillips; Brad Pitt in 12 Years a Slave—following up on his hirsute World War Z role; Bruce Dern in Nebraska; Gravity’s George Clooney and Her’s Joachim Rivers, who, although not bearded in these movies, have, like many, many, other A-list actors [shown at this link to a “Top 51 Hollywood Beards” list], have opted for a personal full-beard look off-screen or for other movie roles. There are now also countless bearded professional athletes. Google “bearded athletes”, and you’ll see how times and face fashion have changed since the NY Yankee’s Yogi Berra [“Berra”, not “Bear” or “Beard”] era. But, try to find a bearded athlete or leading man between 1940 and 1960 who wasn’t playing Moses, Hercules, some other ancient legendary hero or who wasn’t, say, on an Iranian soccer team. Sure, there were character actors with beards, usually portly, villainous or both—but virtually no pin-up, heart-throb male runway, beef-cake or role models. So, why the change—or, rather, why the undoing of the earlier switch to shaving? - what the impact of a beard in a 2014 job interview is likely to be. Perhaps the beard revival is a visible backlash against some perceived assault on or diminishment of classic masculinity in increasingly androgynous, emasculating or otherwise gender-blurring Western culture; or maybe it’s a defensive reaffirmation of raw male power in response to the rise and idealization of the omnipotent chrome-and-barrel-chested Iron Mannish robot as human rival. Or maybe “it’s the economy, stupid!”: For male millennials among the 35% of them still living with their parents and denied traditional rites and rights of passage into male adulthood and success, e.g., a great career, a home or an affordable family, maybe growing a beard has come to symbolize a way—one of the few ways available—to grow up and out. In that respect, it may function like a can of paint in a jail cell: Spruce up the surface and maybe you’ll feel better about being stuck where you are. In his intriguing pioneering 1976 analysis, Body Hot Spots: the Anatomy of Human Social Organs and Behavior, University of Alaska Professor Emeritus R.D. Guthrie gave our understanding of human and animal beards—yes, animal—beards [of which there are many sorts] some very interesting twists, with insights of relevance to understanding why beards are staging such a comeback—make that “growback”. 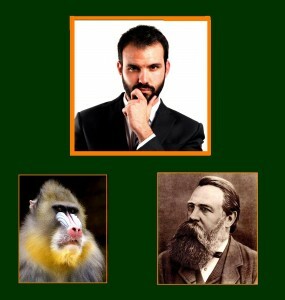 Borrowing heavily from his insights and adding conjectures of my own, the following historically and evolutionarily logical sequence of questions and answers can be considered an attempt to account for not only the resurgence of beards in North America, but also why having one would ever be either forbidden or mandatory anywhere. With a handle [bar] on these, the probable impact, benefits and costs of showing up at an interview sporting a beard may become somewhat more understandable, if not also predictable. Professor Guthrie maintains that one of the key functions of animal beards, as “body hot spots”, including human beards, is intimidation, i.e., threat and menace. That may be one reason why, among the 100 Japanese coeds in a comparative culture course I taught in Kobe, Japan, not one—not one found any beard attractive, despite a history of beards among the ruling elite and Japanese military officers during the Meiji era—at least among those who could grow them, while the vast majority of the coeds felt repelled by them. Hence the mere look of serious menace, whether backed up with the tools and determination to put one’s money where one’s mouth is, i.e., to actually attack with a high probability of success, can suffice to spook and intimidate rivals. Indeed, often, a visual bluff is enough. “Successful outcomes from confrontations are best when one can win by bluffing. So it should come as no surprise that recent research is closely aligned with the sentiments of the Japanese college girls. In 2013, Slate.com reported that women surveyed in a University of New South Wales study overwhelmingly preferred a heavily-stubbled look to beards and to a clean-shaven or lightly-stubbled look. Even though bearded men were judged by both men and women to be most masculine, the straight women found them unattractive. As for why, the researchers speculated that bearded men look “more aggressive” and “less romantically attached”—which, to me, sounds consistent with a club-wielding, hair-pulling, beard-flashing cartoon Neanderthal’s mindset. Males, on the other hand, rated beards highly because of the macho image—both gender results being entirely consistent with Professor Guthrie’s threat thesis that beards suggest intimidating power and menace, as well as chronological maturity. However, the positive implications of an older male’s beard regarding a lifetime’s accumulated wealth and wisdom are offset by the downside of perceptions of diminished physical power and life expectancy. As for the clean-shaven look, it too carries tradeoffs: On the one hand it signals youth, harmlessness, health and a projected long [reproductive/productive] life. On the other hand, it can communicate an impression of low testosterone levels typical of pre-adult males, juvenile subordination to dominant mature males, and therefore low sociobiological rank and an inability to protect a female from more powerful bearded males and wild animal predators. Of course, the follow-up question is—given that many women elsewhere like or don’t mind beards—why would widespread cross-cultural resistance to beards [including in the office as well as among coeds] be so strong? —The larger the jaw and/or the neck of an animal, the more powerful the bite is likely to be; the more powerful the bite, the more dangerous the animal. A beard visually exaggerates both, making the possessor more intimidating, just as a lion’s mane does. Human beards, in being coarser than head hair, look fuller, bulkier, thereby creating an even more dramatic impression of size and menace. –A beard signifies male maturity and, as such, is a visual signal that the possessor is neither a vulnerable juvenile nor a female [in "sexually dimorphic" species, such as humans and gorillas, in which the adult male is typically the bigger and stronger of the two sexes]. As such, the beard signals dominance and a capacity, if not inclination, to do some serious damage to any challenger or subordinate—including any weaker female—that might be tempted to confront or resist such dominance. –Even when actual physical aggressiveness is not communicated by the beard, it can still elicit deference to the power of the possessor, e.g., through rank-and-age associations, e.g., in a patriarchal gerontocracy [rule by powerful male elders]. –To the extent that a beard will conceal the highly expressive corners of the mouth, lip twitches and other facial body language, like sunglasses, it will make it harder to “read” the bearded male—and, as Professor Guthrie notes, effectively conceal any facial expressions or tremors of fear. Shifting our gaze to the male gaze, think of the Clint-Squint Eastwood “Montana face” as a mood-concealing and therefore intimidating analogue of the beard. As a result, a bearded male is more likely to always look fearless, as well as fearsome, when compared with a clean-shaven male. –In a state of nature or of culture, there are only three ways for a male, or anyone, for that matter, to get what is desired: through persuasion, force or fraud. Because the modern civilized male generally has to rely on persuasion to find a [play]mate, i.e., has to somehow make himself attractive, a bearded male who finds himself in a cultural or social matrix in which the inherent menace of beards makes him unattractive will be seriously handicapped, because he has to court a mate, not abduct, beetle-browbeat or club one. However, his remote Neanderthal predecessor may have had no such encumbrance: His task was not to get the girl, but, instead, to get rid of the other guy[s]. If he could intimidate other males [or wild predators] into backing off or away, he could win the female of his plots and dreams, either by demonstrating his capacity to dominate other males and therefore protect his mate, by simply terrifying or subduing her into compliance or by impress her by deterring predators. As I see it, in cultures in which it is the clean-shaven male that is the anomaly and abnormal, e.g., theocratic patriarchal societies, or sects and sectors of the Middle East, in which females have much less say about who they will end up with, male beard displays, posturing and power more obviously serve to deter other males and to intimidate their cloistered women—which allows the threat function of beards to fully manifest itself. In equalitarian, monogamous democracies, beards haven’t fared as well. In the entire history of the United States only 5 presidents had beards while in office—Lincoln [who was the first], followed only by James Garfield, Ulysses S. Grant, Benjamin Harrison and Rutherford B. Hayes. Since them, no president, candidate or nominee has sported a full beard. Not one, even though, presumably, many of them could have grown one. The last president to sport a beard while the incumbent was Benjamin Harrison, who held the office from March 1889 to March 1893. The last U.S. president to display any facial hair at all was William Howard Taft, who had a mustache during his term, March 1909-March 1913. The last beard-wearing member of a major party to run for president was Republican Charles Evans Hughes in 1916. He lost. Yet, even though no more than 15% of all men are left-handed, 4 out of 5–80%–of the last 5 U.S. presidents have been lefties—even if not in the political sense: Barack Obama, Bill Clinton, George H.W. Bush and Ronald Reagan [ambidextrous]. Among the 14 presidents since and including Calvin Coolidge, 7 have been left-handed. Hence, there seems to be a paradox: Among presidents, lefties are clearly over-represented, while full-beard POTUSes have amounted to a meager 12% of the total. I would like to offer two conjectures to explain why the last presidential nominee to have any facial hair was Thomas Dewey, who in 1948 lost to Harry Truman, despite whatever resemblance to Clark Gable he may have had. My first guess is that mustaches as well as beards become taboo because so many of the U.S.-designated villains and dark icons of the WW II, Cold War-Anti-Communist Joe McCarthy and modern eras had facial hair: Hitler, Hirohito, Tojo, Stalin, Marx, Engels [shown above], Lenin, Trotsky, Franco, Himmler, Castro, Ho Chi Minh, and after them, Ayatollah Khomeini, Chile’s Pinochet, Osama Bin Laden and, of course, Axis-of-Evil-Iran’s Mahmoud Ahmadinejad. My second guess is related to making the world safe for democracy. Democratic societies—especially industrial and post industrial egalitarian/equalitarian societies—have operated on a “1-1” rule:1 man-1 vote, 1 man-1 [wo]man marriages, 1 law-1 people, 1 man-1 job [for the most part]. What these 1-1 rules accomplish is to dampen the ferocity of male-male competition and prevent deep resentments among males who otherwise could not vote, find a wife or find a job. By “1 law-1 people”, I mean a system of law that applies equitably, without discrimination or favor of any race, creed, gender, etc. In short, one set of laws for the entire population, conceived as one people. Because of their association with patriarchal power, polygamy, privilege and menace, beards can send the wrong message to an egalitarian-minded electorate and cause candidates to lose by more than a whisker. So, given the recent beard revival, what kind of response can you expect if you are a guy being interviewed by anyone sociobiologically and culturally sensitive to facial hair? If you are clean-shaven, you are likely to either be seen as young, vigorous, “well-groomed”, compliant and free of lice or as not as dominant, strong and confident as bearded rival job applicants. For women being assessed, this duality translates into a cute-beautiful dichotomy—one explored in depth by Professor Guthrie in Body Hot Spots. A boss looking for a powerful, outspoken, take-charge VP may favor a Katharine Hepburn candidate with classic dominant high forehead, hair-in-a-bun coif and high cheekbones. Another, wanting a compliant, obedient, utterly unthreatening customer-service rep may favor an applicant with bangs, button nose, tiny feet and other “neotenic”—i.e., quasi-infantile—markers. If you are a guy with a full beard—and depending on how trimmed it is—you are likely to be seen either as very masculine, mature, wise and strong or as old, unkempt, eccentric and over-compensating, e.g., for a weak or double chin. But, given the current popularity of facial hair, especially heavy stubble, your chances of passing the beard test are better than ever. Of course, the less flinty conservative the organization offering the jobs, the better those odds become. …unless the job opening is in a communist North Korea zoo.